Early season tournaments provide insight into which teams seem to be formidable and other teams that seem to be a bit weaker than originally thought. I’m only going to mention Duke briefly in this because they are not a weak team. We haven’t seen three of their best players on the court yet and they sit at a 6-1 record currently. Those three missing and a roughed up Grayson Allen have left the Blue Devils looking weaker than expected. Once they are at full strength, they’ll be dangerous. I expect some growing pains, however. As a squad of five on the floor, you grow accustom to how each person plays. There will be pretty plays as well as a fair share of ugly, ugly plays. Michigan State seems to be waffling on this edge of good and great. Unfortunately, the schedule Sparty has endured since the season began is bringing critics to say they are okay and average. I’m not surprised of their result up to this point. What is surprising is how they haven’t really been in many games in which I thought they’d vie for a win. Tom Izzo has taken responsibility for scheduling, but a lot of it comes down to the players on the court too. Eron Harris doesn’t seem to have stepped up to the level of what is expected of him. I was speaking with my mom recently and she mentioned that Harris is in his senior season. This baffled me because I remember him transitioning from high school to college! My hope is that he owns his leadership role and that translates to a better production on the court, influencing his teammates around him. Creighton may be the team that has had the best start to this young season. With their 7-foot freshman center, Justin Patton, playing beyond expectations, the Bluejays have dominated teams. Add to that a backcourt that plays fast and flows freely, a fast, unrelenting performance by Creighton is now the expectation whenever they take the floor. I was curious about how Creighton would transition from the Missouri Valley Conference to the Big East. I predicted that it would fair well with a future NBA pick in Doug McDermott. After he left, how that squad faired would be telling about recruiting. Well, I would say that Creighton has blown expectations out of the water. In each of the first six games they have played this season, the Bluejays have eclipsed 80 points. The only time they didn’t was against a defensive-minded Wisconsin Badger team in which Creighton put up 79 points in a game that had 66 possessions. Creighton will have an incredible resume by the time tournament time comes around and should be vying for a mid-single digit seed. Every few weeks, I’ll post brief updates on how mid-major teams are faring over the course of the season as they look to make a bid for the NCAA tournament. I haven’t posted about mid-majors since the beginning of the season, but here are a few that have made some noise from the beginning of the season until now. Apparently not everyone had heard of the rebranded Fort Wayne Mastodons (formerly IPFW Mastodons), but they have arguably one of the biggest upsets of the season to date. In an odd twist, the Indiana Hoosiers took their talents to Fort Wayne, Indiana to broaden their viewership of those that may not make it down to Bloomington for the Indiana Classic. Indiana desired to demonstrate their guile and strength on opponents for decades, paying helpless opponents to visit while onlookers witnessed incredible feats of scoring. IU, once undefeated in their own showcase (not surprising if you schedule teams that barely win games over the course of a season), lost to Fort Wayne. And it was great. Anunoby was sick and the Hoosiers didn’t have the best shooting night, but the resolve of the Mastodons, after being pushed, provided for an exciting early season game and upset of a powerhouse of a college basketball program. Rhode Island has started this season in a strong fashion, compiling a 5-1 record with their one blemish a 10 point loss to Duke. Their most impressive win came against Cincinnati on November 19th. After trailing most of the game and down 11 points with 18:39 left, Rhode Island clawed their way back and won a hard fought game by 5. Their schedule doesn’t let up with road games at Valparaiso, at Providence, home against Old Dominion, and at Houston. This stretch could be telling how the Rams will fair when Atlantic 10 play begins. I’m hoping the Rams weather this stretch with a 3-1 record at worst and dominate the A-10. The Butler Bulldogs were active this past week, participating in an early season tournament again over the Thanksgiving holiday. Andrew Chrabascz was named tournament MVP as he played to his second career double-double against Vanderbilt in the first game on Thanksgiving. In the championship game, the Bulldogs beat Arizona for the first time in program history. The last time the two played was back on March 21, 2001 during the second round of the NCAA tournament. Both teams played during that 2000-2001 season as well. Both teams had some great players. From Arizona: Richard Jefferson, Gilbert Arenas, and Luke Walton. From Butler, Lavall Jordan (currently the head basketball coach for the UW-Milwaukee Panthers), Darnell Archey (record holder for most consecutive free throws made in Division I), Brandon Miller (former Butler Head Coach), and the late Joel Cornette (dunking over IU to beat them in 2001). Since 2001, Butler has made it to an in-season tournament final 9 times. In those finals of early season tournaments, the Bulldogs have won 6 times and lost 3 times. In the last few years, Butler has weathered three coaching changes, but still brings its best effort against the top teams each year. Listed below are Butler’s results versus non-conference teams ranked in the top 10 since 2012. Someone had asked about “trap games” for the Bulldogs before conference play begins. The upcoming schedule for Butler isn’t a walk in the park. With an away game at Utah this Monday, Butler will have played 6 games in 13 days. That is not an easy way to begin a non-conference schedule, and I expected the Bulldogs to have at least 1 loss by this point going into their game against Utah. I would consider the game at Indiana State a trap game for the Bulldogs on December 7th. Indiana State lost their three games in their early season tournament, but they were all lost in the final possessions of those games. The Sycamores are a tough team to beat, especially when ISU is playing at home against a ranked, in-state opponent. This will be the 129th meeting between Butler and Indiana State. Butler currently holds a 4 game win streak dating back to 2007. I fully expect the Sycamores to be challenging Butler when they play in about a week. It’s time for the fun stories to show themselves in this week’s fastest and slowest games of the week! Utah Valley 114 vs. BYU 101, 96 Possessions – The Citadel was knocked off the top spot for fastest game of the week! It was the first time that BYU has given up this many points in regulation since they gave up 118 points to Arizona in 1974. Arizona St. 127 vs. The Citadel 110, 91 Possessions – At least The Citadel is consistent. I had to put this game in just to demonstrate the fact that more possessions does not always equal more points. In the game listed above, The Citadel played in a game with 91 possessions, however they only put up 63 points. In this game, they played the same number of possessions, but were able to put up 47 more points. Hopefully this gives ASU confidence when traveling to Kentucky! Virginia 63 vs. Providence 52, 53 Possessions – Virginia will be tough to beat when it becomes this efficient on both the offensive and defensive sides of the ball. Providence has, to this point, given Virginia all they could handle. Virginia 62 vs. Yale 38, 56 Possessions – Tied for the slowest game of the week, Yale struggled to score more than 40 points, scoring only 38, the lowest output for any team this young season. Mercer 58 vs. Radford 47, 56 Possessions – Plainly put, this was a very boring game. The halftime score was 27-14, in Mercer’s favor. I wanted to put a plug in for Virginia and their defense. They haven’t played the most difficult schedule by any means, but what they have done to opponents is incredible. They have held opponents to point totals of 51, 32, 38, 34, 41, and 52. This challenge began in 1999 and was dominated for the first 10 years by the ACC. I use dominated loosely because they have won on numerous occasions 6-5. As this year’s challenge gets underway, I am picking which teams I think will win each matchup (I will be honest since the first two games have already been played yesterday). Teams I predict to win are bolded and italicized. Overall, I have this year’s ACC/Big Ten Challenge resulting in a 7-7 tie. As I mentioned earlier, the ACC won the first 10 challenges. Since then, the Big Ten has won 5 times and the 2 have ended in a tie. College basketball is in full swing and with Thanksgiving coming up, that must only mean one thing – the early season tournaments have arrived! In this post, I will be exploring the potential matchups (or reviewing previous ones already played), expected winners and dark horse winners for most, but not all of the tournaments. In the most magical place in the world, (according to family, most people of the western world, and especially the creator of the destination) Disney World hosts a solid group of basketball teams, especially with Xavier, Oklahoma, and Northern Iowa as favorites. I have Xavier as the favorite and was surprised to see Missouri hang tough with the Musketeers through to the end. A gaffe in decision making allowed Xavier to escape by 1 point. Northern Iowa blowing out Arizona wasn’t surprising. I figured they could take care of an Oklahoma team that, while missing Buddy Hield, still possesses great leadership and an ability to score the ball. Davidson will be a team to watch carefully, especially come conference time. I would consider them a middle of the pack A10 team that, if they are able to stay in some close games, could build a strong resume. Turning to a tournament with an elite team and handful of mid to low level teams, don’t be surprised with Villanova taking this one. UCF should be able to take a couple wins to play against Villanova in the championship. UCF’s height will create major problems for Villanova. I would take Villanova’s experience over UCF’s height, however. In a place I’d rather be right now, the Creighton Bluejays are my favorites to win this tournament. After a convincing home win against Wisconsin, the Bluejays should be able to handle their opponents, although they do have good competition among them. It’s unfortunate to see NC State play Creighton before the final game, but I would have say that Montana could surprise some people. The Griz have been on the cusp of great wins in the last couple of years and are due for a great result. This is a good opportunity to do that. Ole Miss can put up points and I have them as my dark horse to look for. I was slightly confused by this bracket layout, but after investigating, it made more sense to me, slightly. There are two brackets – the Naismith bracket seems to have better caliber teams including Duke, Penn State, Cincinnati, and Rhode Island. The Springfield bracket has teams that wouldn’t stand much of a chance against the teams listed prior. The Springfield teams include Marist, Brown, Grand Canyon, and Albany. Of those teams, I would pick Grand Canyon because they have the ability to put up points quickly. In the Naismith bracket, I have Duke as the favorite, but Rhode Island could be the dangerous team. As I wrote in my previous post, Rhode Island has a strong team this year that could bust some brackets come March. I just watched the Rams overcome a 12 point deficit to Cincinnati. The Bearcats possess a strong defense and efficient offense that can cause problems for any team. This deep field will not have a shortage of great games. With Wisconsin, Oregon, and Georgetown headlining the tournament (the last seems to be questionable now with an awful loss to Central Arkansas at home), My choice as the favorite is North Carolina. The Badgers will slow teams down and play at their pace, but it will have to hang tough with some strong offensive firepower, especially North Carolina. With a few new faces in the rotation, Nigel Hayes and company will be tested. I think the final is Wisconsin vs. UNC with the Tar Heels taking it. I want to put a plug in for the most disappointing team in NCAA at the moment is also in this field. Will the Connecticut Huskies be able to turn things around in Maui and upset a few teams? Headlining this tournament are the likes of Baylor, Michigan State, Wichita State, and Louisville. A talented and young St. John’s team will push the pace and increase the number of possessions. Their youth and length will breed upset or disaster most likely. Wichita State has been impressive in their wins this season, having only blowouts to account for on their unblemished record. Their opponents would seem to be gutter teams, but they beat a Long Beach State team that was touted as a tough team to beat. If the Red Storm can make their 3’s, this will be a much closer game than Sparty would like. I see the Spartans moving on though. A similar format to the Hall of Fame Tip-Off tournament, there are separate brackets, a Hosts’ bracket and a Visitors’ bracket. The Hosts’ bracket includes Arizona, Butler, Santa Clara, and Vanderbilt. The Visitors’ bracket includes Bucknell, Norfolk State, Northern Colorado, and Sacred Heart. Arizona comes in as a heavy favorite to make it to the final as they play Santa Clara in the semifinal. If Santa Clara wants to upset Arizona, they’ll have to go back a few years, recruit different players, make a lot of 3’s in the game and play incredible defense. As the first part is impossible to do, they will have to rely solely on grit and play a slow paced game. I see Butler joining Arizona in the final, beating a Vanderbilt team with a new, yet intelligent coach. Bryce Drew will look to build off a fresh start with the same intensity from his players to take on the best teams. There are many more tournaments, both bracketed and non-bracketed. However, I covered ones that will most likely get the most coverage. Also, I don’t have a lot of time to cover others because of life’s responsibilities. I do enjoy writing about college basketball and plan to do it more frequently this year. Inspired by Ken Pomeroy, a statistician that many players and coaches across college basketball use. He provides incredible scope and detail into the fun and unexplored intricacies of the sport of college basketball. To date, the least likely win of the season comes from Arkansas State. Their foe: the Georgetown Hoyas. Kenpom’s formula for chance of winning a game gave Arkansas State a 2% chance of winning. In fact, depending on where you look, Georgetown was a 22 or 23 point favorite to win that game. At one point, Arkansas State was up by 23 points. Something I will track week to week throughout the 2016-2017 college basketball season are the fastest and slowest games. Games between Division I teams are the only ones that will be considered in this research. Numbers will come from Ken Pomeroy’s website. Usually depending on timing, I am striving to get this information out either on Saturday or Sunday. These numbers will date back a bit further to the start of the season, Friday, November 11th. In an impressive feat, Holy Cross claims two of the lowest scoring point totals of the season in the two slowest games of the season thus far. Holy Cross is allowing their two opponents 70.4% shooting and over half of their opponents are grabbing missed shots at a clip of 51%. Basically, you could throw a ball up at the rim 10 times, and you can be confident your teammate will come down with it 5 times. To be fair, Holy Cross’s two opponents have incredible length. Ironically, Holy Cross had more offensive rebounds than Syracuse, holding a 16-15 advantage. As I mentioned last year when I began this blog, my passion for college basketball was fueled by a variety of people and experiences. 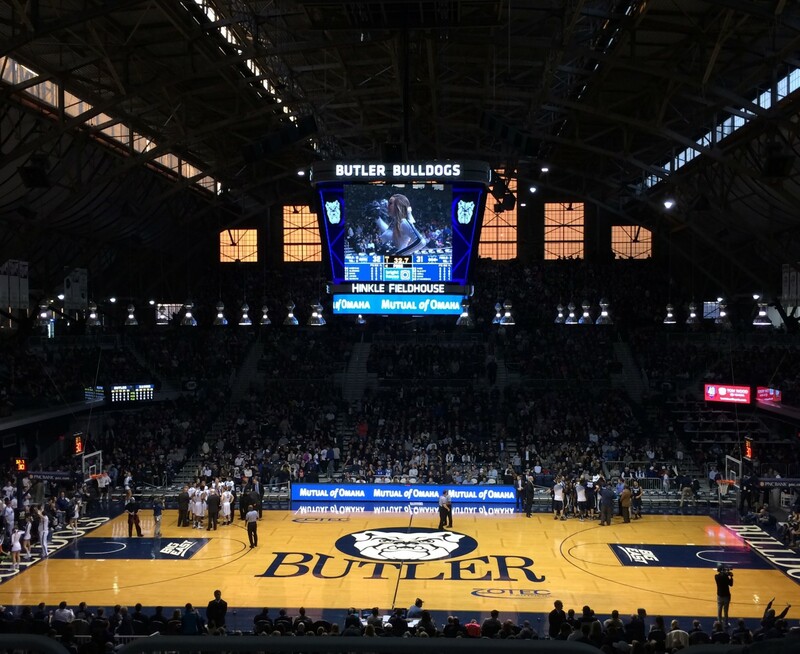 My shared experiences with my grandfather at Hinkle Fieldhouse watching the Butler Bulldogs over a period of fifteen-plus years cemented my passion and support for the Bulldogs and the sport of college basketball in general. I will provide my own thoughts which will definitely vary from others because we are all entitled to our own opinions. I’m encouraged and impressed with Tyler Lewis’s leadership on the court. He has maintained his push the pace style, yet has improved his passing and decision making to begin this season. The addition of Kamar Bladwin at the point guard position provides depth and an athletic complement to Kelan Martin when both are on the floor. Baldwin’s intensity on defense allows for transition points for himself and others on the floor. I anticipate Baldwin playing a major role for the Bulldogs as the season progresses. Andrew Chrabascz is probably one of the most fun players to watch mainly because of his reactions to plays. His intensity on the court from one play to the next provides encouragement to others. He knows when he is in the wrong and quickly wants to make it right. His desire to create space in the lane for his shots will continue to be rewarded throughout the season. Maybe not in points, but he can increase the number of assists by finding the extra pass to a player cutting to the basket. The Bulldogs will play Norfolk State on Monday this week and then travel to Las Vegas to take on Vanderbilt in the semifinal of their tournament on November 24th. The Dawgs will play either Santa Clara or Arizona the following day. I expect Butler to handle Norfolk State easily. I think the Bulldogs will play a close game with Vanderbilt before winning by double digits and then keep it close with Arizona before falling. Once the Bulldogs find their identity this season, they will be tough to beat. Welcome to the 2016-2017 college basketball season! It’s been a long wait and it looks to be an exciting season with a large group of teams nipping at the heels of a few elite teams. With the emphasis of giving offensive players space to create for scoring opportunities, don’t be surprised to see longer game times, more fouls, and higher scores (for the most part). It’s a trend the sport has seen since the 2012-2013 season with a lot of touchy calls. It seems to effect the first 6-10 games for each team during the regular season and fouls seem to be less frequent. I could also fall into the ignorant category and not notice the calls because I have become numb to the zebra’s whistle. Whatever the case, expect the number of fouls called during a game to decline slightly over the season until we get to the postseason. Officiating in conference tournaments and the NCAA tournament seem to become even more relaxed, allowing players a bit more jostling and bumping than during the regular season. Is it too soon to project what will happen in just a few short months? It’s something we love to do as a human, think about the future and not live in the present. It’s no secret that the favorites to win it all next April are the Duke Blue Devils. With one of the most talented teams to take the floor this season, it would be considered a let down if Duke fails to make the Final Four. It’s obnoxious. I don’t like saying it. I don’t want to, but ignoring something isn’t healthy. The Kentucky Wildcats will again be considered a preseason favorite to compete for a title run in April. A lot of things can happen, and with a young team, there’s a lot of room for growth…and a lot of room for mistakes. Beyond the two listed above, there don’t seem to be any other clear elite teams in the college basketball field at the beginning of the season. There are, however, a handful of very good teams that, on a given day, can challenge and beat the best. The following are teams that you can expect to have a productive season and have a deep run into the post season. Indiana will be an interesting team to watch as the season progresses. They have the talent and a majority of the pieces, but they desperately need a point guard. They have great ball handlers, but having a point guard to run their offense will solidify a deep run for the Hoosiers. Arizona seems to be in better shape than most teams out west. Oregon is still the favorite to win the Pac-12 at the moment, but Arizona will be a good challenge. Purdue returns a solid team that is a top tier Big Ten team that no one should take lightly. They have the pieces to have a deep run in March, especially with Caleb Swanigan returning, but will they be able to defend when push comes to shove? Michigan State lost four starters, but it is a team with Tom Izzo as the coach. He has an uncanny ability to get the most out of his players. Expect to see Sparty play an important role in the Big Ten this year. Xavier has consistently produced a solid team over the past decade and a half, albeit with some character issues that follow. Don’t be surprised if this Xavier squad gets a high single digit seed come Selection Sunday. Villanova could be up in the elite – they should be since they’re the reigning National Champs. They have excellent players, especially in do-it-all guard, Josh Hart. Their formula for winning is methodical offense and stingy defense. They have probably the best opportunity to repeat as National Champs since Florida did it back in 2006 & 2007. Kansas should be able to win their 13th straight regular season title this season. They always seem to have a way of underperforming in the tournament. Will they play their best ball at the end of the season? The Wisconsin Badgers seem locked in to have another strong year and I would put as the slight favorites to win the Big Ten. It’s a tough ask this year as one could argue any of the top 5 Big Ten teams could come out on top in that conference. Rhode Island looks to build off of a less than stellar season last year where expectations to thrive were high. They may not be on the radar for most people, but this group is dangerous and ready to challenge the blue bloods. Middle Tennessee State and Giddy Potts (probably one of the best names in college basketball this year, bring back a punchy team that manhandled Michigan State in the tournament last year. They’ll have to get through Conference USA, a conference that has better teams than most people think, but if they can make it through without too many scratches, be prepared for Giddy and company to make headlines again. The Akron Zips come in under the radar with a boatload of talent. This team takes care of the ball and work efficiently on offense. The key for them is to get to the line this year. They were less than impressive at getting to the line. I feel like leaving Belmont off this list each year would be disrespectful. After making 60%+ on 2 pointers and launching an average of 18 3’s per game, Belmont has the firepower to hang with any team. They just need to make their 3’s. Is it fair to call Butler a Cinderella? I will have a column in the next week about what makes a Cinderella. At any rate, the Bulldogs have the best team that they have probably ever put together. Don’t be surprised if the feist Dawgs are clawing their way through the postseason. Fort Wayne, formerly known as IPFW, has rebranded itself which has nothing to do with their capability to make a push into the tournament and ruin some brackets. The Mastodon’s have been picked to win the Summit League after losing to South Dakota State last year. With their sharpshooters and height, Fort Wayne has the build of a darling this March. Illinois State has been lurking in the shadows of Wichita State. No matter – if you are looking for a true Cinderella this year, this is the team. They can do some real damage, but they have to get through the Shockers first. Virginia Tech quietly had a solid season last year, winning their last 5 games. Buzz Williams has had enough time to develop this program and we will begin to see the Hokies contend in the ACC. Although they finished 7th in the conference last year, they should be in the thick of things come conference play. Dayton has incredible talent and their coaching ranks as one of the best in the nation. With a solid non-conference schedule and the ability to put away teams in the A-10, the Flyers should be one to watch come tournament time. Ivan Rabb should be Cal’s go to scorer this season. A majority of their offense will go through him as he is a center that has great footwork and can finish through contact. Markelle Fultz from Washington will be fun to watch this year. He can get to the hoop and pushes in transition. A weakness that he needs to focus on is his ball handling. John Konchar of the Fort Wayne Mastodons is a name to know now so you aren’t surprised by his shooting abilities later. He seems to be everywhere on the floor, closing out last season with a 10 point, 18 rebound, four-assist, six-steal performance. Oh and he shoots lights out from anywhere on the court. With Fort Wayne losing three starters, his percentage of shots taken during a game should rise substantially. Elijah Brown from New Mexico torched the Mountain West in scoring last year, averaging 21.7 points per game. What can he do this year to help get the Lobos back to the NCAA tournament? Mike Daum is someone to watch closely, mainly because of his story of how he got to South Dakota State. While playing in an AAU game, he recorded making 12 3’s in one game. Coaching staff from South Dakota State asked and found out no one was recruiting him. They offered him a scholarship and when he got to campus, they found out he couldn’t maintain his level of play. After redshirting his freshman year, something clicked, and he had the highest per 40 minute average in points last season. Oh, and he came off the bench averaging 15.2 points and 6.1 rebounds in 19 minutes per game. A key component to a team’s success is the coach. Numerous coaching changes went on during the offseason. Here is a look at the changed landscape of college basketball coaches and where they landed. Georgia Tech: Out goes Brian Gregory after what could be described as abysmal record with the Yellow Jackets. After leading Dayton to a successful string of winning seasons, things did not work out as well in the ACC having never reached the NCAA tournament and consistently finishing below .500 in the ACC. In: Josh Pastner left Memphis most likely to start fresh. He brings experience working with talent. We’ll see what happens when he builds his own program, and whether or not he is given the time to do so. Oklahoma State: After a 155-111 record and 5 trips to the NCAA, Travis Ford is gone. Of those 5 trips, there was only one win – something that does not look good after having that many opportunities in the postseason, especially from the Big 12. In: Brad Underwood looks to make the transition from coaching Stephen F. Austin to Oklahoma State. With the mentors of Bob Huggins and Frank Martin, it will be interesting to see how Brad’s coaching career pans out at Oklahoma State. Pittsburgh: Jamie Dixon was consistent in bringing a team to work together selflessly and be competitive in most games when they took the court. However, after 13 seasons, he is moving on to take over head coaching responsibilities at TCU. In: Kevin Stallings leaves Vanderbilt after 17 seasons moving from one Power 5 conference to another to get a nice restart. Rutgers: Eddie Jordan is gone after having won less than one-third of the games he coached. In: Steve Pikiell comes from Stony Brook in the hopes to get Rutgers back to the NCAA tournament for the first time since 1991. Oh and winning in the Big Ten would be helpful too. Rutgers has a combined 3 wins in the past 2 seasons in conference play. Stanford: Johnny Dawkins is gone after 8 years and only one NCAA tournament appearance. He did win the NIT twice, so that’s something. In: Jerod Haase is a capable coach with a strong background of success. As a coach at UAB from 2012-2016, he helped lead 14 seeded UAB to an upset over 3 seeded Iowa State. His playing days at Kansas, as well as coaching with Roy Williams at North Carolina, should continue to help him see success as the new Stanford coach. Wisconsin: We’ve known Bo Ryan has been gone since he resigned in December. He leaves behind an outstanding legacy and career as a college basketball coach. In: Greg Gard stepped in as interim head coach and dropped the interim label to start this season. Gard demonstrated an ability to coach as he helped Wisconsin get back to the NCAA tournament after a tough start to the 2015-2016 season. I’m looking forward to watching college basketball this season! Be on the look out for the next article on what makes a Cinderella. What feedback do you have? What do you want to see covered or explored? I’m open to reasonable ideas.